Brian Eno famously developed a deck of cards to help himself to think freely under pressure. His insight was that when you’re in a stressful situation, or you’re working too hard, or you’ve run out of ideas for solving a problem, your patterns of thinking become rigid and constrained. Each card contains one sentence designed to steer thinking in unexpected ways. 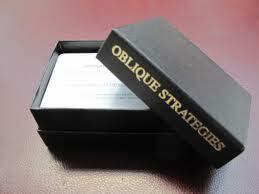 He calls these Oblique Strategies and examples include Use an old idea, State the problem in words as clearly as possible, What would your closest friend do?, Try faking it! and Work at a different speed. No need to answer. You can get a random strategy online at joshharrison.net and you can read the whole set at www.rtqe.net.